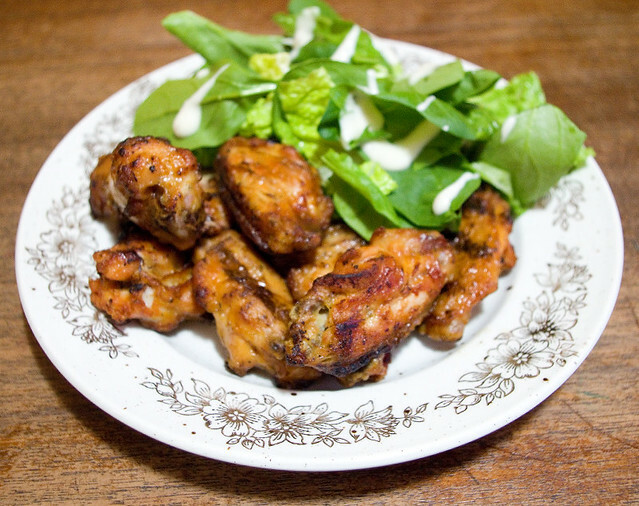 Last night’s dinner was a simple one: baked, precooked frozen chicken wings from Costco, and a simple salad of romaine lettuce and baby spinach. The wings were Sun Chef Fully Cooked — Fire Grilled Roasted Chicken Wings with two sauces. I’d never tried these specific wings before, and they were… Okay. I mean, they weren’t fantastic, but they weren’t bad either. Passable, I guess the word would be. There are better pre-made chicken wings out there, though, even at Costco. There are seasoned, uncooked ones sold in the refrigerated meat section that have much better flavour. I think next time that’s what I’ll buy if I want to have an easy chicken wing meal. Posted on February 27, 2018 February 27, 2018 by owntwohandsblogPosted in CookingTagged chicken, dinner, easy, fast, food, lettuce, review, salad, simple, spinach, supper. Probably not the salad dressing, though! Although I’m sure you could find one that you could eat.